Langoustines are a shellfish popular in the Mediterranean and France. They have sweet, white meat like a lobster and are the size of a large prawn. A variation on the famous japanese rice roll with langosutines, avocado and sesame. Langoustines poached in a flavoursome stock served with a broad bean, pea and sundried tomato salad. 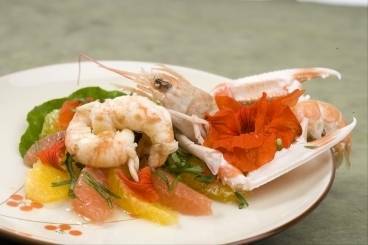 Pan fried langoustines served with an orange and grapefruit salad and edible flowers.